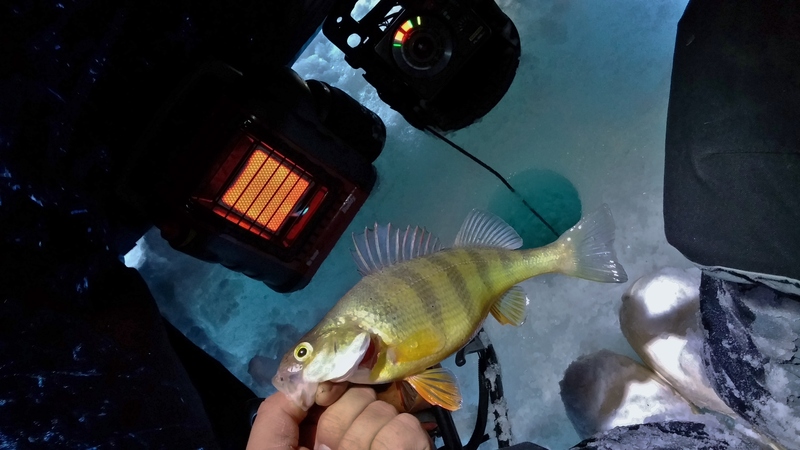 Here is a video compilation from earlier this winter while we were searching for walleye. 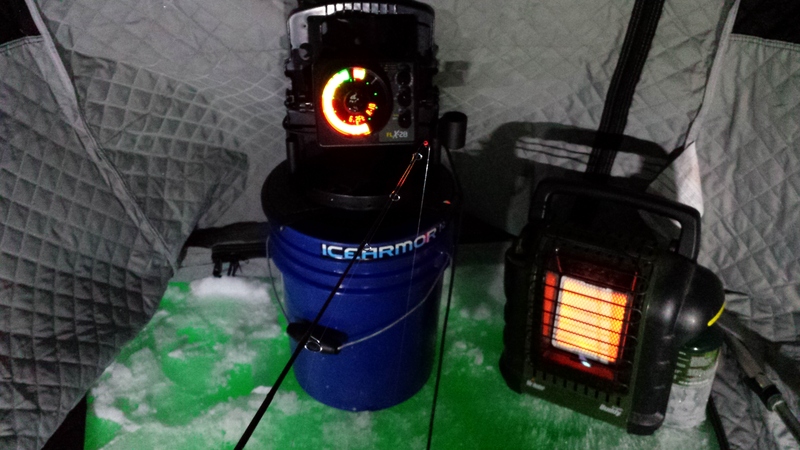 I pulled my shack up to my desired first hole still in the dark with hopes of some healthy Champlain panfish. I cut a few holes so that I could hop to when the action slowed up but with the severe cold I planned on spending the majority of my day in the warmth of my shack! After cleaning my hole, igniting my heater, and baiting up my jig, I dropped down. Immediately I was greeted with the red glow of a fish rising from the weeds on my Vexilar. I was hooked up with my first crappie of the day! Nothing to complain about with with a 12″ crappie on the first drop! From there, the fishing never slowed. There was an abundance of various sized gills. The crappie were around but with the concentration of gills, they didn’t stand a chance! I could have sat in one hole all day but it is very hard for me to be content when I know that there are better fish nearby. 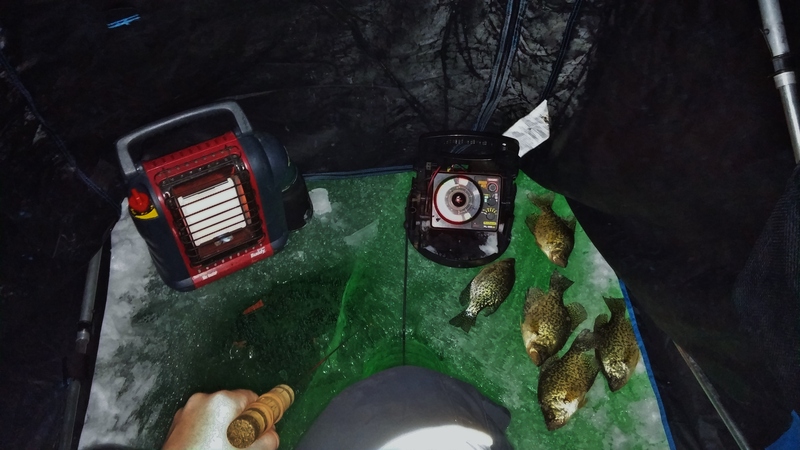 I cut in all different directions and used my underwater camera to search for a hole with a better concentration of crappie. When I found what I was looking for I shacked up and started fishing. The crappie were happy to bite and after putting about a dozen topside I hooked into something significantly larger. The battle pursued for several minutes with multiple long runs. 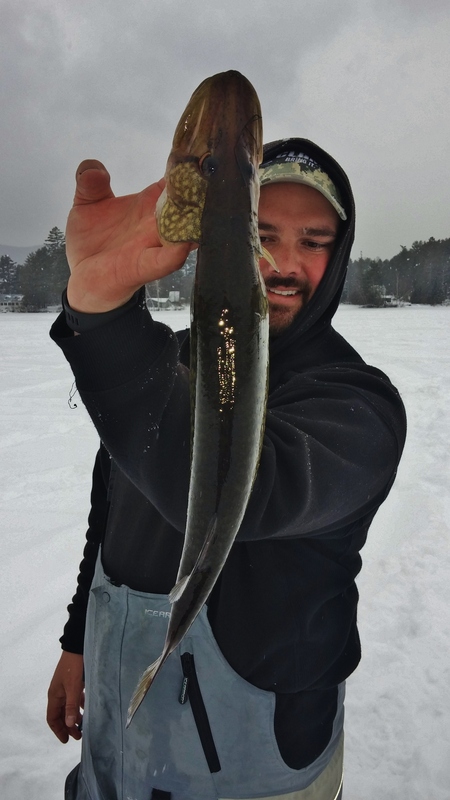 I was happy to finally see the head of the 30″+ pike poking out of my now cloudy hole. 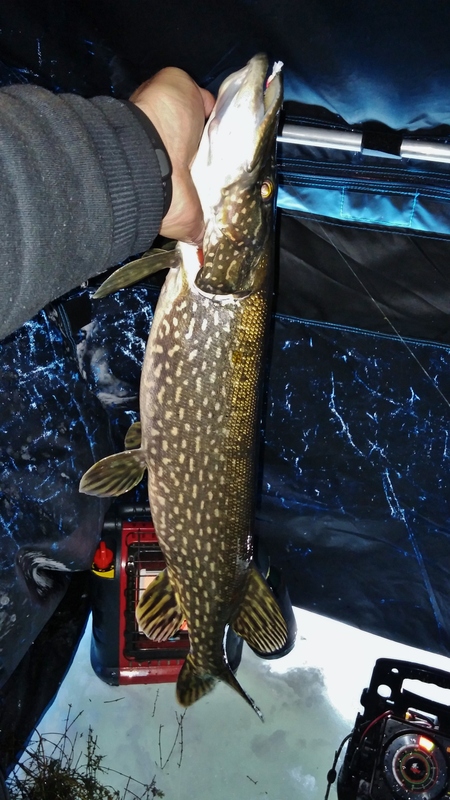 It was cool to land a nice pike on 2 pound test but I was bummed that the hole was no longer fishable. 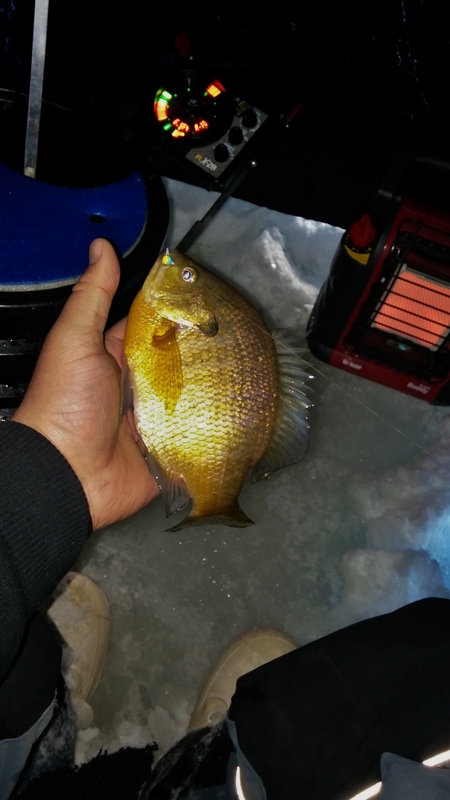 I had just about every weed within 15 yards laying in top of the ice! Shortly after, I found another concentration of fish and shacked up for the remainder of the day. I packed things up for the day around 4 and headed for home. A long day on the ice put a few nice meals on the table! 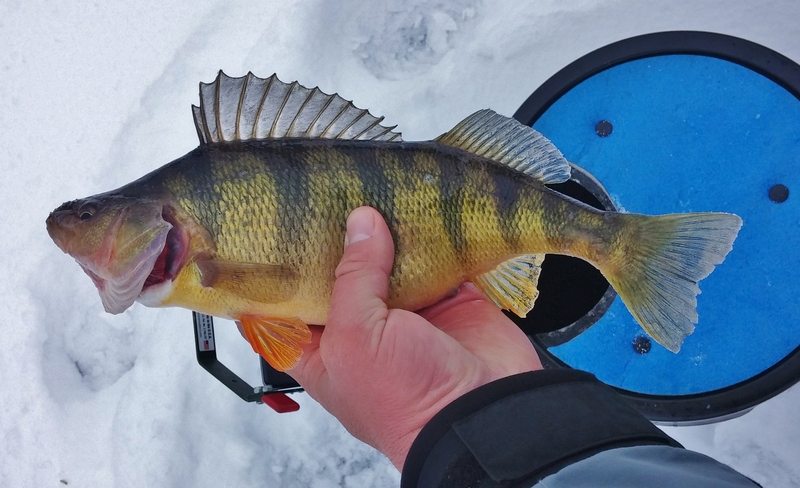 Deep water perch can be a difficult thing to pinpoint and at times will make you want to give up. When I head out looking for them I consider a good day ending with anything over 20 in the bucket but I don’t consider less a failed trip. I know that they move and sometimes it is just impossible to keep up with them on foot. 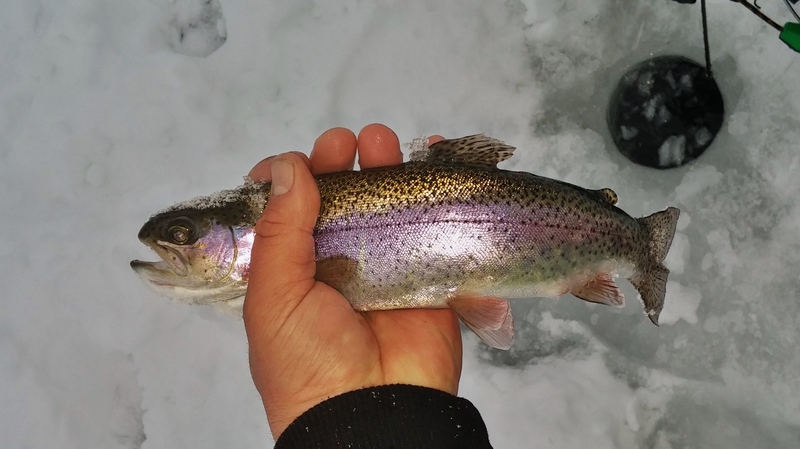 On my most recent trip, I started off in 35-40 feet of water but was unable to locate anything over 8″. The small fish were everywhere and very aggressive. Up until about 8 am I caught nothing worthy of going in the bucket. With the numerous small fish around I gave up on my drop shot rig and started fishing with tungsten and maggots. I was marking a few marks suspended 6 to 10 feet off bottom so I figured that would be a good place to start figuring that the small found would be mostly loyal to the bottom. Before I made it half way down I had fish rising up and they were big ones! I was catching quality fish but missed quite a few because of the amount of time it took to reach bottom. I ended up calling it a morning around 11 with 18 fish in my bucket. 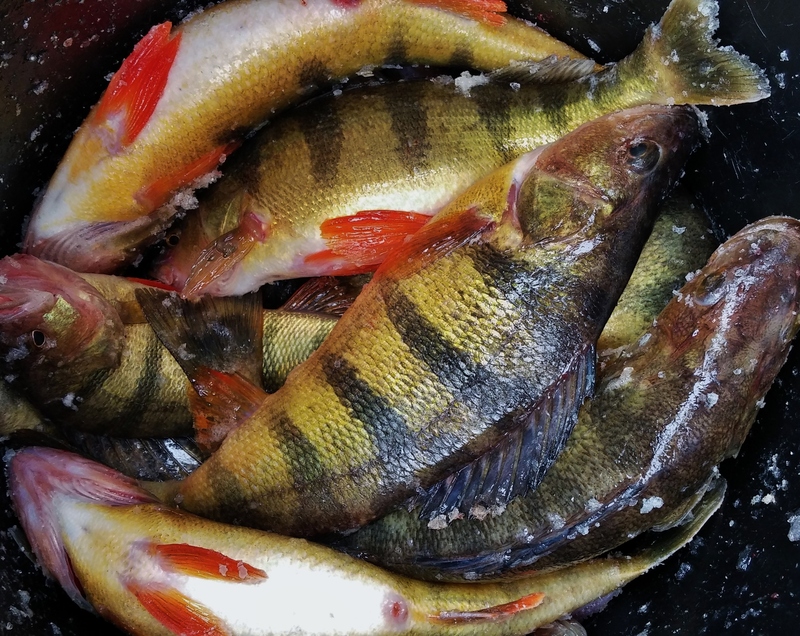 I needed to hit the bait shop for some minnows before moving on to the next body of water for an afternoon bass and pickerel bite! After a rough day yesterday I needed a little redemption. It was Superbowl Sunday so I figured things on the ice would be quiet. We were the first ones on and with holes drilled we started fishing. The bite was steady but not hot. We picked and poked at lots of crappie and a few nice gills. They liked anything gold or white and when they got tight lipped a single maggot made a world of difference. The bite changed a few times throughout the day. Early on they wanted things moving upwards very slowly. Around 9, jigging around 3 feet off bottom called in most fish. Towards the end of the day jigging down was the only way they would bite. Being able to figure out these different patterns wasn’t hard but if we hadn’t things would have been much less enjoyable. When it was time to head home, we both had some nice fillets to cook up for a game time snack! There is always a day or two every winter when you should just stay home. Today was cold, really cold, that was the root of all problems. I knew things were amiss when I tried to fire up my auger. It always starts within 3 pulls no matter the temperature but it didn’t. I pulled and pulled until it finally fired but the pull cord didn’t coil back up. I had snapped the recoil spring and wouldn’t be able to get it running again until it was replaced. 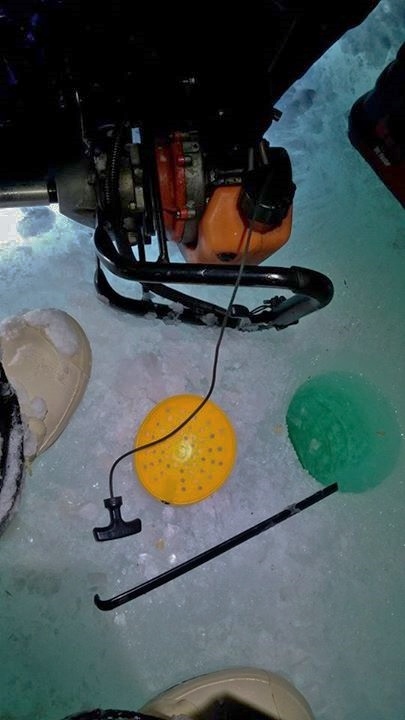 I figured that I better cut all necessary holes so I dealt with frozen hands to make sure that we could find fish. The fishing was off and only a few holes showed suspended fish on the flasher. After setting up my shack, i started scooping my hole only to break the ladle clean off! Frustrated, I tried different jigs, plastics, and meat but nothing seemed to work. While working the suspended fish a mark appeared on bottom. I dropped down and landed an 8″ gill. While it wasn’t great it was better than nothing. 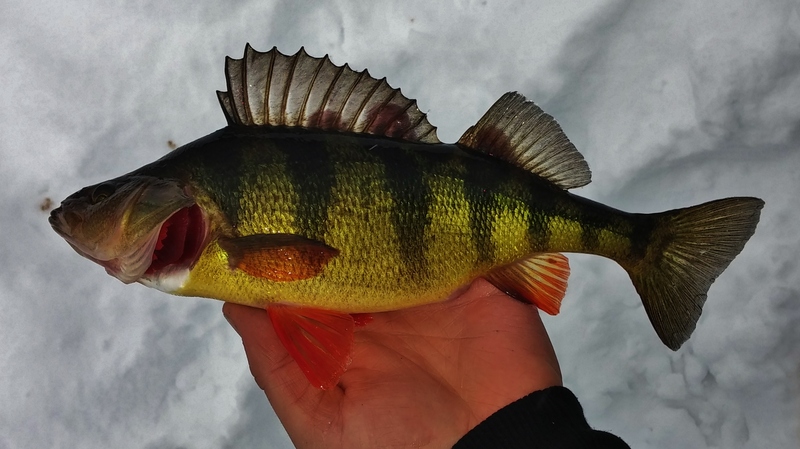 For the next 20 minutes I caught a couple more gills, some decent perch, and one micro crappie. Nothing special but it redeemed the troubles from prior. I figured that I would be better off sitting at home working on my auger than catching a few fish so I packed up and headed home. After a few calls, I found the necessary parts and was ready for the next day! After a successful jigging new waters, we decided to test out the night time crappie bite. 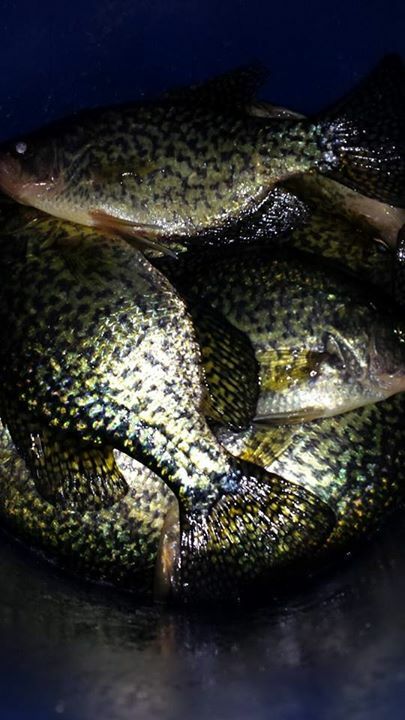 As many of your probably already know crappie can often be great night time feeders. Most fishermen choose to fish at night using some sort of illumination, anything from a lantern to a car headlight. For a few years now we have been fishing for crappie and trout at night use the Hydroglow Fishing Light. 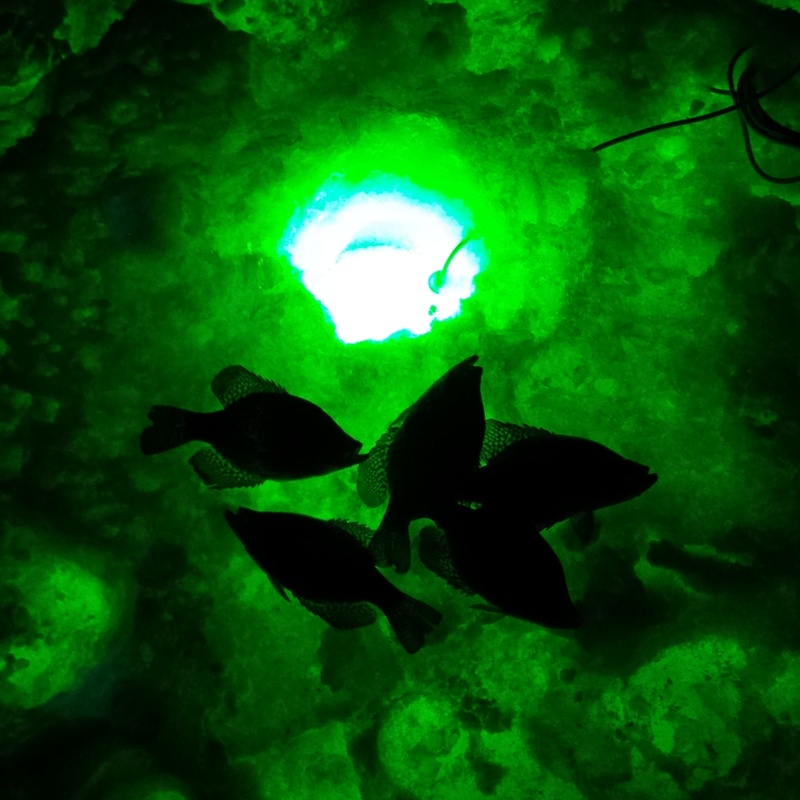 The Hydro Glow illuminates by using Green LED’s which are less abrasive to the fish and their feeding attitude. We cut three holes, put the light in the middle hole and shacked up. As you can see in the pictures below the light really illuminates the ice and the water underneath it. It didn’t take long for the light to begin attracting bait-fish and crappie. Dylan hooked into a crappie within the first 10 minutes of the light being deployed. Night fishing requires a lot of patience. 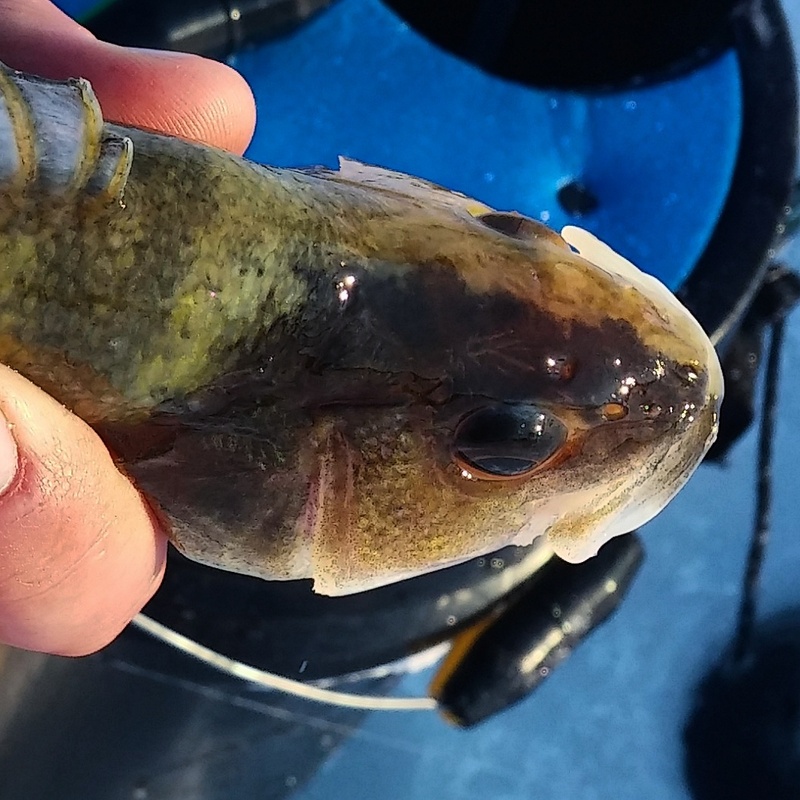 The fish typically are cruising at night searching out an easy meal. The longer you can stay in a hole with fish nearby the better chance you will have of putting a few topside. We fished them the same as we would during the day. Small jigs tipped with Maki Plastics and spikes. The area we were fishing didn’t have much for weeds or any other kind of structure. When you would mark a fish on the bottom they were usually pretty easy to entice them into biting. 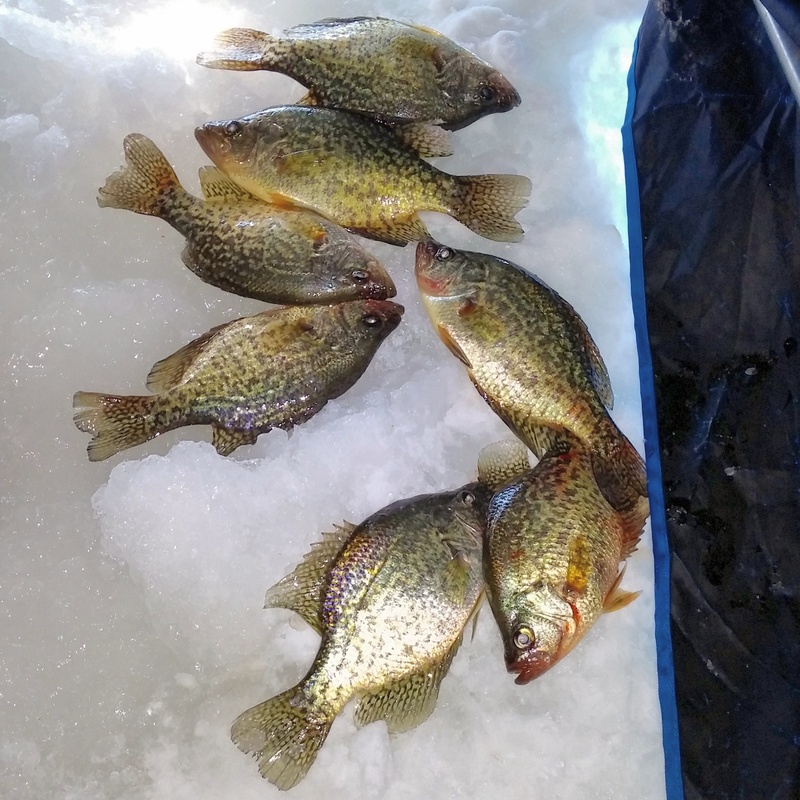 We were able to ice a decent number of crappie with a few bluegill and perch mixed in a matter of a few hours. Not a bad first trip for a new spot.